This is one of those easy dinner ideas that can made in the morning, refrigerated and dinner is ready. This is a healthier alternative to macaroni salad, potato salad or pasta salad. 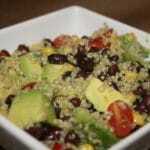 This might be my favorite of all my quinoa recipes. And I have a lot of them! Quinoa is the latest “superfood” these days. I love it. It’s so versatile and can be used in so many different ways. 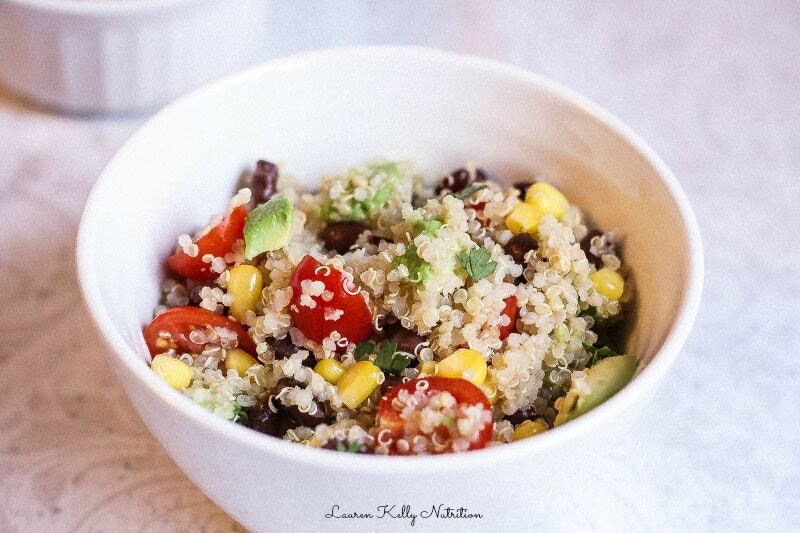 Quinoa is loaded with magnesium, iron and calcium. It is the only grain to have all nine essential amino acids which also makes it the only one to be a complete protein. 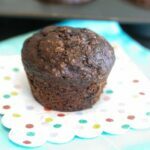 It is low calorie, has a lot of fiber and is also gluten free which is perfect for those with gluten sensitivities. Avocados are packed with fiber, potassium, Vitamin E, B vitamins and folic acid. They also have monounsaturated fats (healthy fats) which help to lower blood cholesterol. Black beans are also packed with fiber and protein as well. Tomatoes have antioxidants and Vitamin A and C in them. What happens when you put all of these nutrition powerhouses together??? 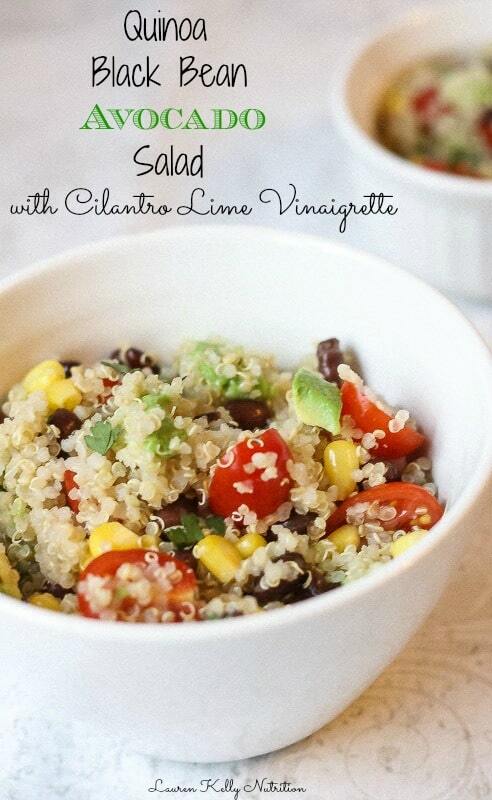 One delicious, healthy salad! I always like to keep a separate bottle of this dressing in the refrigerator for salads, roasted vegetables, you name it! Thanks, my boys were intrigued by the “seed salad” 🙂 My husband and I really liked it. Hey There. I discovered your weblog using msn. This is a very neatly written article. I will be sure to bookmark it and come back to read extra of your useful info. Thank you for the post. I’ll definitely comeback. I am so happy to her that! I really love this one too 🙂 Thanks for letting me know! 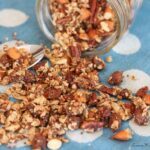 I’m loving everything about this recipe!! All my husband’s favorite flavors all in one bowl. Perfect! Hi – any suggestions if I don’t have grape seed oil? Is there a good substitute oil? Thanks! This looks wonderful! I have quinoa but I’m still a little intimidated by it! I took this to a party yesterday and everyone loved it! Hey this looks delicious! I’m going to make some for work next week! How long will it keep in the fridge? Hi Andrea! This should last up to 4 days in the refrigerator! Thanks so much, I hope you like it! Needs a bit more “kick”, and would be great. As it is, the recipe is okay. Just a little bland. Would love to hear what others have added to make this great. Hi Michelle! I am sorry you thought it was bland. I think the cilantro and lime give this lots of flavor, I am not sure what you think it was lacking, but I would love to hear some suggestions! Thank you! So amazingly bright and delicious…we completely devoured it last night! Thank you! I am so glad you liked this Robin, it’s one of my favorites! This is such a delicious salad. I love quinoa! 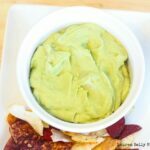 I love using grape seed oil in my dressings -great recipe! Can’t wait to try this salad!!! all of my favorite things! What a wonderful, healthy recipe!